The X-Series earmuffs are 3M latest advancement in hearing conservation. New technologies in comfort, design and protection all come together in this groundbreaking earmuff line. The X4P3E utilizes a newly designed spacer, specially formulated foam liners and innovative ear cushions to help improve attenuation. 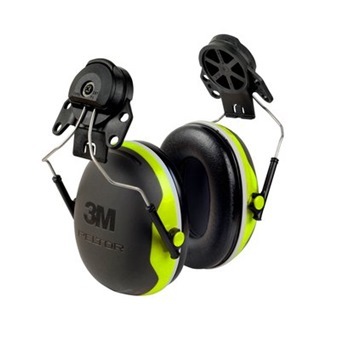 This lightweight, lower-profile earmuff helps with compatibility with other personal protective equipment and is designed for protection against moderate-to-high level industrial noise and other loud sounds. Earcup pivot points tilt for optimum comfort and efficiency. Replaceable ear cushions and foam liners ( hygiene kit HYX4). Noise Reduction Rating (NRR)a 25 dB. CSA Class A. The NRR may overestimate the hearing protection provided during typical use.